May 5, 2015 February 26, 2019 - The 'Noms. A great pizza place, we hope you try out Spin! 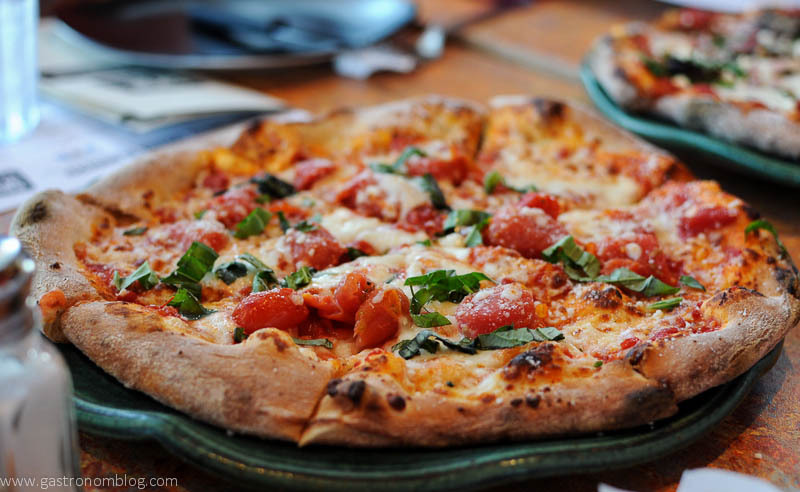 Neapolitan Pizza! Sponsored Post: While we were invited to attend this event for free, all opinions are 100% our own. We were recently invited to a blogger event at Spin! Neapolitan Pizza in Papillion where we got to meet some other local Omaha bloggers, as well as taste some tasty food! 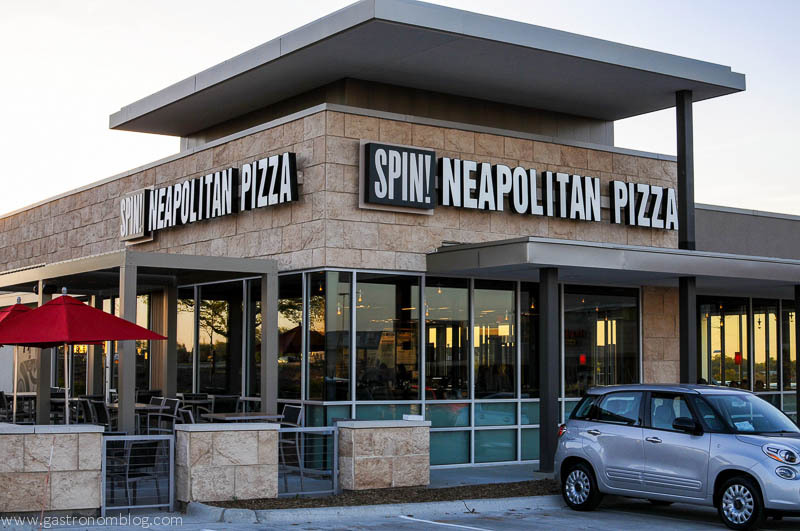 Both of us love Neapolitan style pizza and with Spin’s fame to claim being its take on Neapolitan style pizza, we were excited to have the chance to check them out. After a quick introduction about Spin! and welcome from the manager, we got down to the business of eating. We started off with three of Spin! 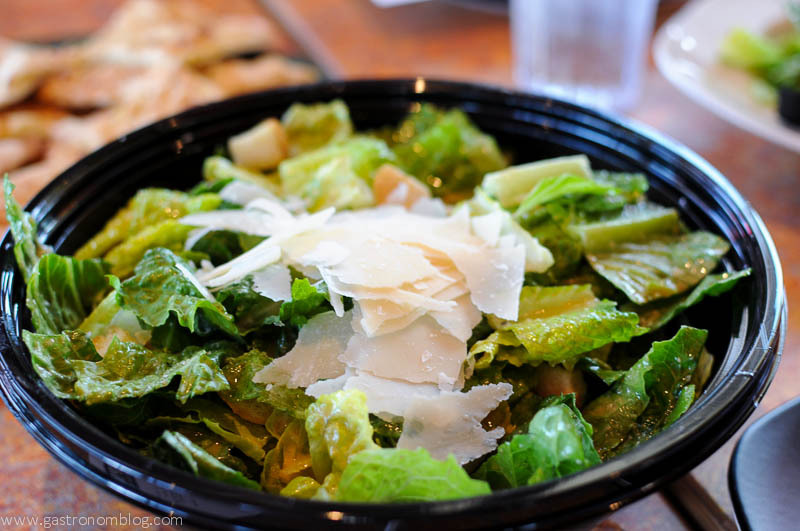 Neapolitan Pizza’s six salads, the Caesar, Greek and the Sonoma. Spin also was happy to accommodate one of the party who had dietary restrictions and brought out a gluten free version of their Caesar salad. The salads were accompanied by two plates of flatbreads seasoned with garlic and rosemary with a splash of rosemary infused olive oil. 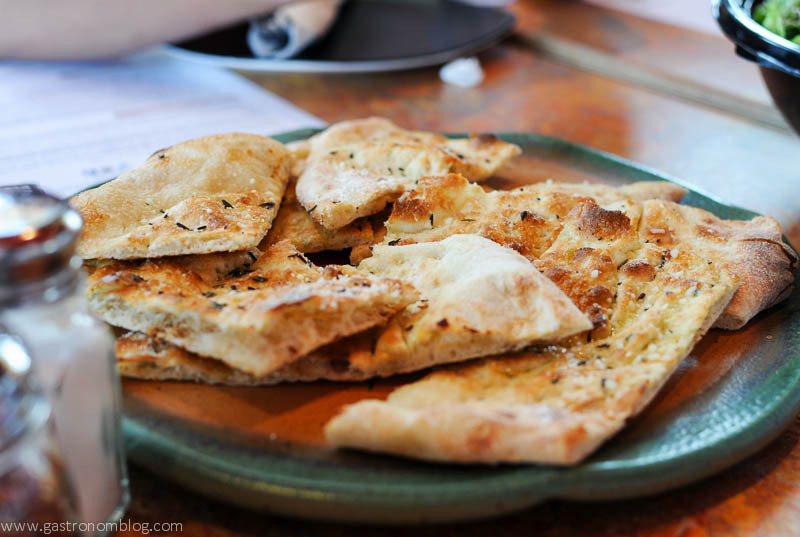 The flatbreads are crispy on the outside while still being airy and tender inside. The splash of rosemary olive oil gave the bread a nice herbal richness. They also brought out a gluten free flatbread, but we didn’t have a chance to taste it. The Caesar salad is made with chopped romaine lettuce, fresh croutons, grana padano (an Italian cheese similar to Parmigiano Reggiano) with a house made Caesar dressing. The salad comes lightly dressed, the grana padano creamy with a salty finish that brings out the rich tangy dressing. 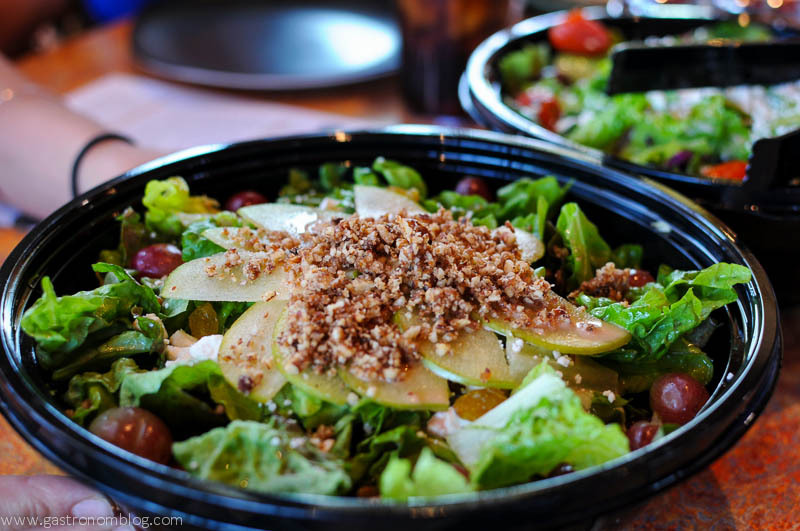 The Sonoma salad features mixed greens topped with grapes, golden raisins, apples, goat cheese and house glazed pecans. Tossed with a fantastic house made Blood Orange Vinaigrette, the combination of tangy goat cheese and sweet fruits with crisp greens and crunchy glazed pecans made for a delicious salad. 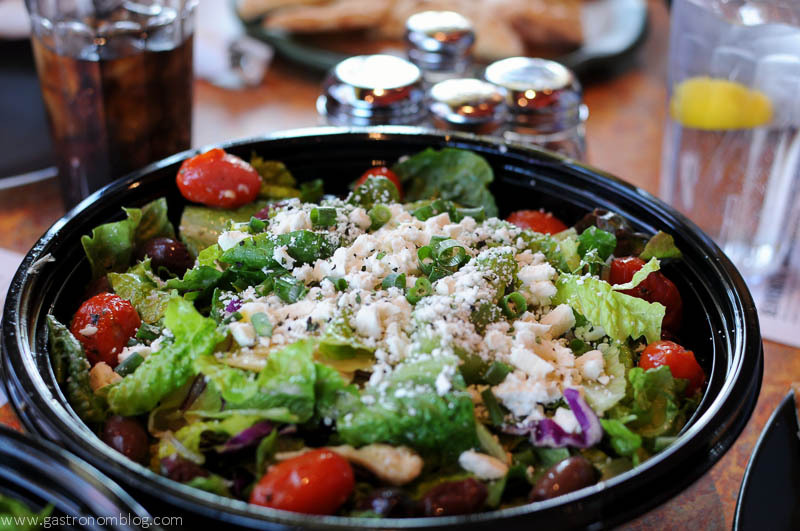 The Greek salad brings classic flavors of Greece, with fresh cucumbers and artichokes, feta, roasted grape tomatoes, scallions, Kalamata olives and oregano atop fresh chopped romaine lettuce. House made Red Wine Vinaigrette finishes the salad with a bright hint of sweetness. Since Spin! Neapolitan Pizza is a pizza place, the main event for this menu tasting has to be the pizzas. Spin brings some serious culinary chops to their pizza game with the menu developed by James Beard award winning chef Micheal Smith, and the attention to making folks happy is very apparent in the pizzas. Almost everything is fresh and made in-house, except for their meats, cheeses and gelato. We had a chance to try just seven of their 20+ different specialty pizzas, and had they kept bringing pizzas out, Mr. Nom probably would have happily kept trying them! Spin! features three different crusts, Spin’s original crust, a rustic whole wheat and a gluten free. As our group had some dietary restrictions, we had a chance to try all three styles and found all to be very good. 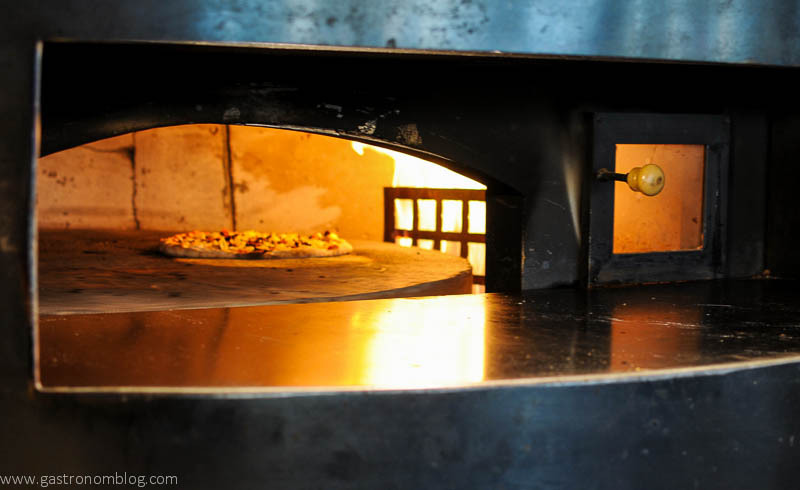 All of the pizzas are cooked in their spinning stone oven which is kept super hot and cooks the pizza in just three minutes. We started with with the Spin! Roasted Margherita, which features the traditional Italian combination of fresh mozzarella, roasted grape tomatoes and basil. This is the original Neapolitan pizza, the colors of the ingredients representing the colors found on the Italian flag while showcasing the crusty and bubbly wood fired crusts and great cheese. The simplicity of this pizza doesn’t mean it isn’t delicious, and Spin’s version of the Margherita pizza hit all the points of the classic. Our next pizza was the Primavera. Topped with fresh mozzarella, red peppers, spinach, red onions and Crimini mushrooms, this pizza was as visually appealing as it was tasty. The onions, muchrooms and red peppers all were nicely roasted to bring out the natural sweetness, which played well with the rich toasted mozzarella. This pizza was made with Spin’s whole wheat crust, which came out just as delicious as the original crust, just with a hint of nuttiness from the whole wheat. For those wanting a bit healthier version of crust, the whole wheat crust would be a fantastic alternative. 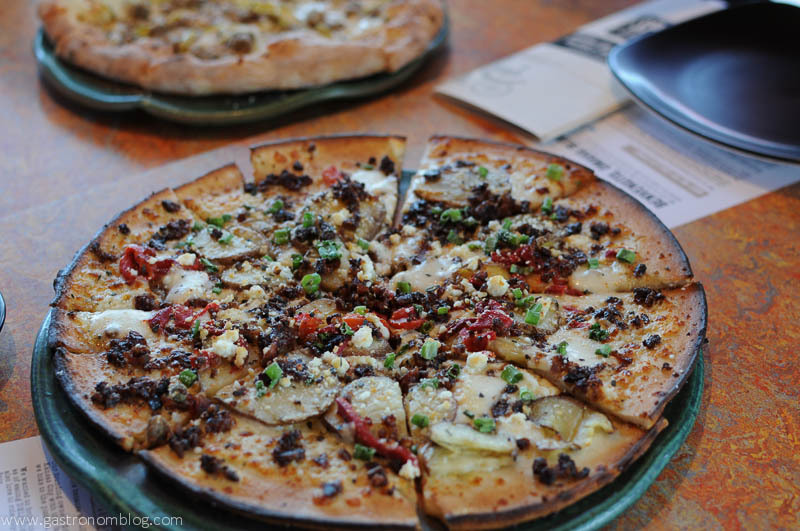 Our third pizza, the Italian Sausage & Apple, is one of Spin’s “white” pizzas, which use a garlic infused olive oil glaze rather than their traditional red sauce of crushed tomatoes. 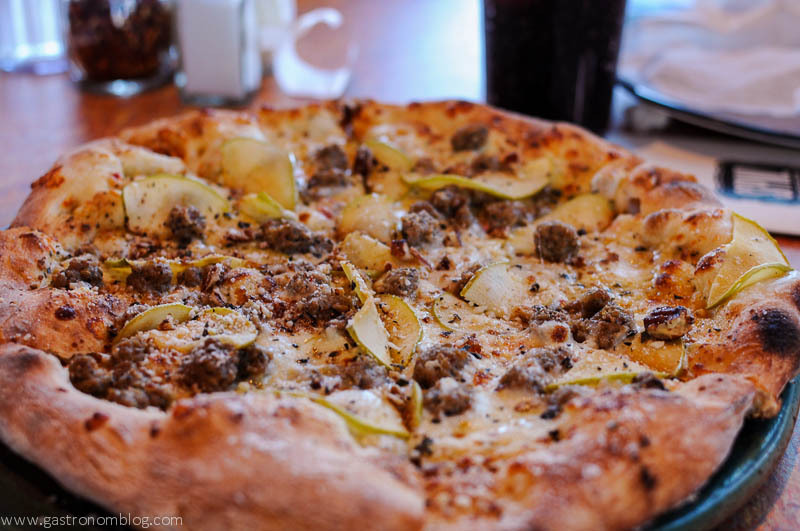 Large chunks of Italian sausage and thin slices of tart Granny Smith apples topped the melted fresh mozzarella. House made glazed pecans gave a hint of sweet crunch that played off the tartness of the apples and the buttery mozzarella. One member of our party had dietary restrictions and were very interested in the gluten free options that Spin offers. All the staff at Spin! were sure to let us know they were happy to make accommodations if possible and they offer a number of great options already on their menu. They brought out a gluten free version of the Roasted Potato, Pancetta and Goat Cheese. Thin slices of roasted potatoes, slices of roasted red pepper and scallions top a bed of melted mozzarella and base of the garlic olive oil. The gluten free crust was pretty good, and was a surprisingly good alternative for the original pizza crust for those who want a gluten free option. 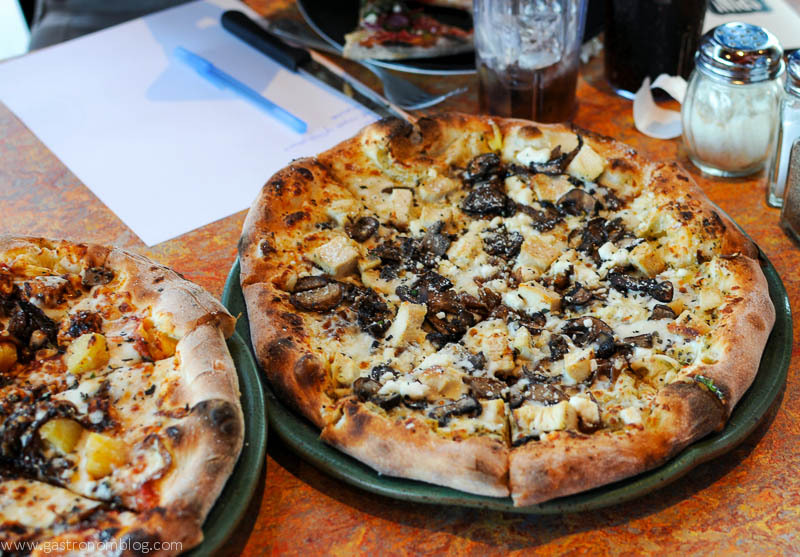 One of the most intriguing pizzas was the The Pollo Arrosto & Chevre (roast chicken and goat cheese). The chicken is house roasted in the pizza oven each morning and had a subtle hint of smoke and char from high heat in the pizza oven. Tangy goat cheese and fresh mozzarella, crimini mushrooms and caramelized onions gave this pizza layers of flavors, with each bit having bits of rich creamy cheese, earthy mushrooms and sweet onions. The final 2 pizzas we had were the Greco and the BBQ di Pollo and Pineapple. The Greco (which also was served with gluten free crust) comes with spinach, Kalamata olives, roasted red peppers and feta on top of red sauce. The Greek flavors all meshed nicely and made for a tasty pie. 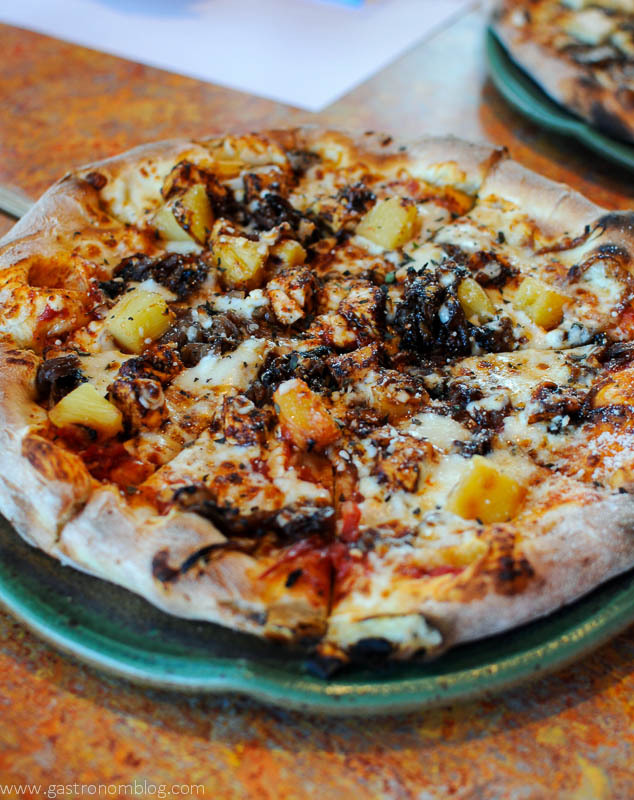 The BBQ di Pollo and Pineapple was Mr. Nom’s favorite pizza, the combination of fresh mozzarella, sweet caramelized onions, and two types of bbq sauce. Spin partnered up with Kansas City icons, Gates BBQ and Roasterie Coffee Company to come up with two sauces used on this pizza. This pizza was unique in that it had the peppery and smokey Gates BBQ sauce mixed with pizza sauce on the pizza, and while the chicken is covered with a sweet Roasterie Coffee bbq sauce. The Roasterie sauce had hints of coffee and mocha that picked up the smoked chicken and gave the pizza a delightful perfume of smoked meat. Sweet and tangy pineapple cut the richness of the mozzarella and heat from the Gates BBQ sauce to make each bite delicious. We finished off the meal with a cup of Spin! gelato. A whole menu card of delicious flavors to pick from made it really hard to choose (One of everything please!) We chose the Blueberry Buttercookie and Mackinac Island Fudge. The Blueberry Buttercookie is made with fresh blueberries and chunks of butter cookies and tastes like a sweet creamy blueberry muffin. The Mackinac Island Fudge is made on Michigan’s Mackinac Island, had a rich vanilla base and chunks of nutty fudge mixed in. They regularly rotate the gelato flavors so there is always new flavors to go back in and enjoy. Spin! opened it’s first restaurant in Kansas City in 2005, and they have an interesting take on “wheels.” Their name Spin! 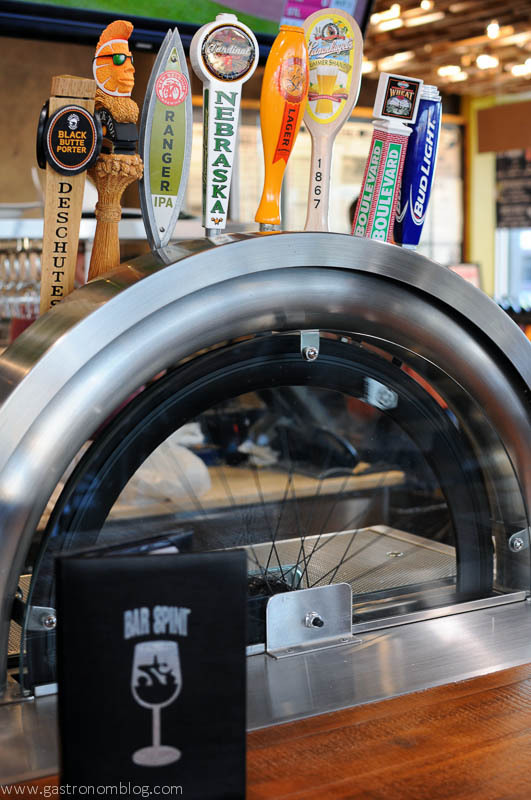 is derived from biking in Italy, and their oven cooks the pizza by spinning, and there is a bicycle wheel that spins under the beer taps. The Italians like to bike, so at Spin! they spin bicycles and spin pizzas! Here are their locations, and they are growing! As we mentioned earlier, Spin! is happy to accommodate people with allergies or if people are watching their diets. If you aren’t feeling in the mood for pizza, they also offer also soups and sandwiches, so there is a little bit for everyone. They offer a number of drinks perfect for pairing with pizza, offering a number of different wines, sangria, and local craft beers on tap. Each location of Spin! tries to be heavily involved in their community, and Omaha’s location is prepping for a number of fun local events. 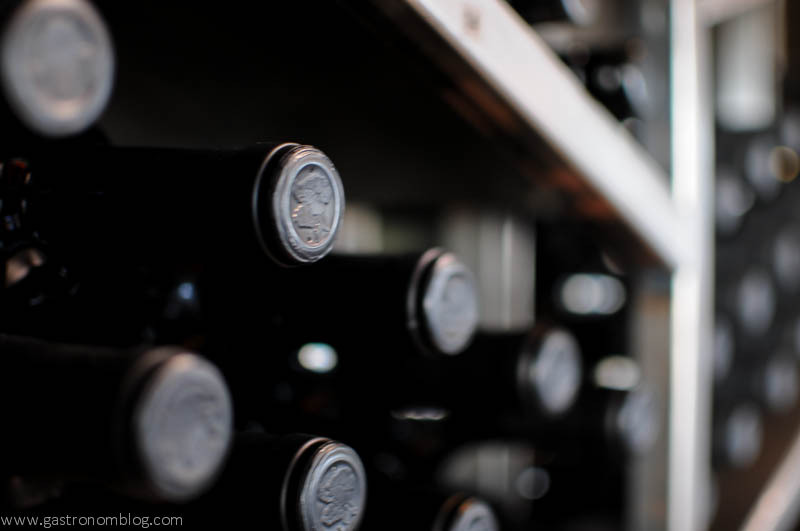 They are planning a a wine dinner at the end of May in Papillion, as well as Bike rides and fundraisers throughout the summer. Check out their Facebook page for updates on upcoming events. Spin! is planning a Ribbon Cutting and Open House on Thursday, May 7 from 4-6 pm. Spin! is a fast casual restaurant, so you order and pay at the counter, but a server brings out your drinks and food. They shoot for 7 minutes at lunch, and 12 at dinner, but if you go for a date night (or just a night away from children!) let them know and they will let you take all the time you need for dinner, as well as enjoy a beer or glass of wine! Spin! also offers call ahead to get your meal and take it home if you are in a hurry! Check out our second trip to Spin! With a Beer and Pizza pairing event! It was pretty tasty! I have a weakness for roasted veggies, and they brought it! It was! Hope you go try it! 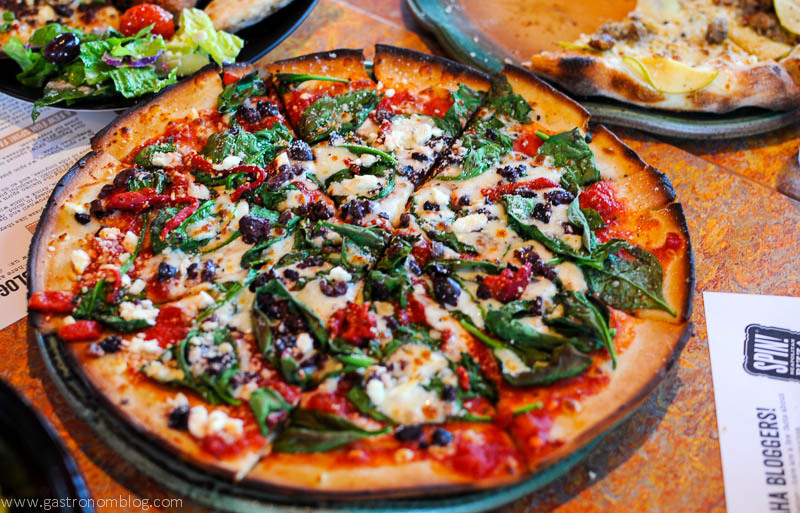 I love veggie toppings, especially spinach, feta cheese, fresh tomatoes and black olives. Yum!!! The primavera was my favorite – all those roasted veggies! You would probably love the Greco! 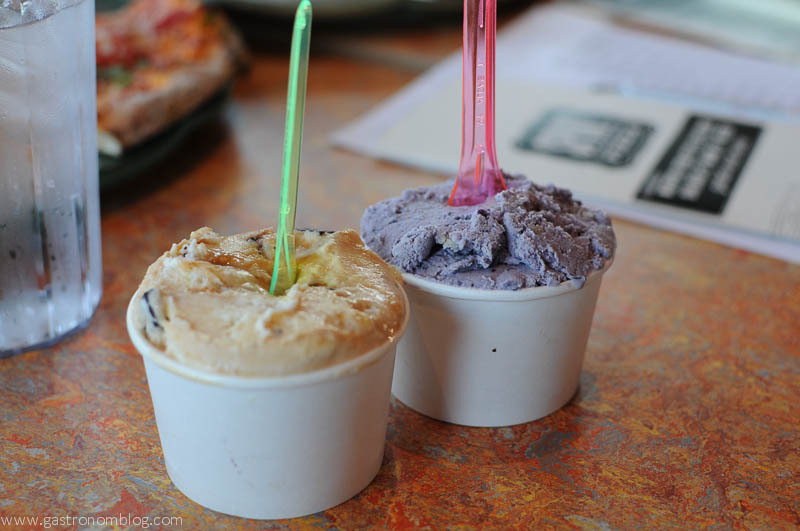 Oh my gosh the gelato and Greco pizza look amazing! I love any kind of pizza with feta cheese! The Greco would be your favorite, then! They have a build your own pizza option – make it your own! That sounds like something me and my hubby would love. 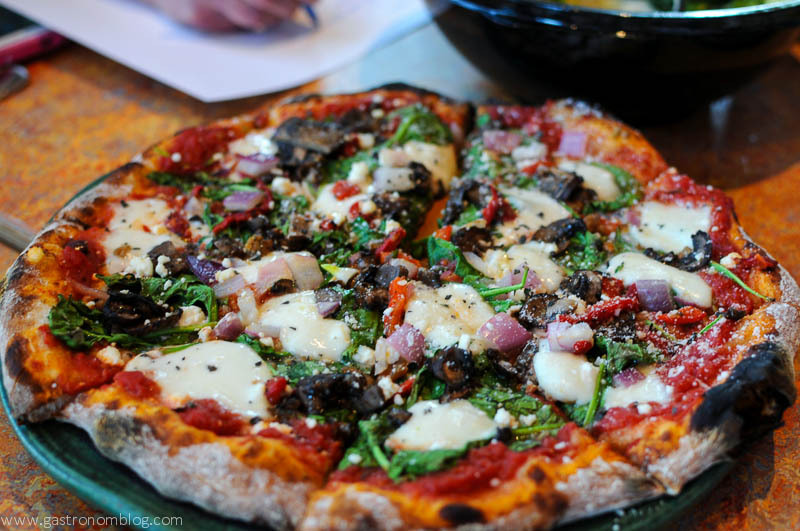 The Primavera pizza with roasted veggies along with a salad and a Boulevard would be perfect on a date night out. Looks like a place the hubs and uI will have to try on our next date night! Love Spin Pizza! My husband is a pizza but and there is one right down the street from us.. So good! The Italian sausage and apple sounds amazing!! The sweet and salty combo was great! Ham is a favorite topping in our house. They all look so delicious – especially the BBQ di Pollo and Pineapple! It was very tasty. Nice and smoky bbq sauce! My favorite toppings are Bacon and Pineapple. So yummy! I have never eaten there! Would be fun to try it out!! I love veggies on my pizza. This place looks amazing!! I love all kinds of pizza!! We’ve had their chicken pizzas! And my son loves the appetizers! Your pictures are mouthwatering! Great post! Thank you! Enjoyed yours as well! My favorite topping is pepperoni, especially when it is a little overcooked and burnt around the edges. These all look amazing. Chicken and goat cheese especially!! Everything looks so delish! Can’t wait til they open up a spot a little closer to me! They are growing all the time, it could happen! i love pineapple on my pizza. all the photos are mouthwatering…i’m starving. love your blog! I love trying new pizza! Would love to win so we have an excuse to go up and try it!! It’s so good! Good luck!